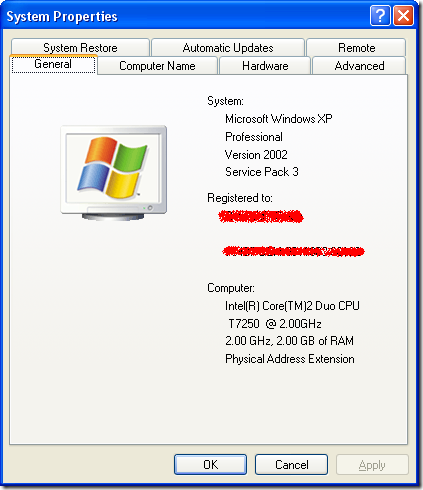 There are multiple ways to display the Windows System Properties dialog box. Click on Start -> Right Click on My Computer -> Click Properties. On the keyboard, press and hold the Windows key (usually located besides the Alt key, which is usually located besides the long Space Bar key). Then, while holding the Windows key, press the Break key (or, the Pause key). Those keys usually located on the top right of the keyboard. note: Some notebook may require you to press and hold the Fn key in order to access the Pause or Break key.